Garden City, NY: Garden City Publishing, 1927. SIGNED AND INSCRIBED by Felix Count Luckner on front endpage -"By Joe never say die! I hope you one day will fully appreciate what a great father and charming mother you have. I am very proud to know them as my friends ! To Bill Hays with best wishes Felix Count Luckner xmas 31". Bill Hays (Will Hays Jr.) was then the 16 year old son of Will H. Hays, who managed Warren G. Hardings successful campaign for the Presidency of the U.S. and was subsequently appointed Postmaster General. After a year in that position, he resigned to become most famously known as the first President of Motion Picture Producers and Distributors of America. Felix Count Luckner was a German nobleman, navy officer, author and noted sailor who earned the epithet Der Seeteufel (the Sea-Devil) and his crew that of Die Piraten des Kaisers (the Emperor's Pirates) for his exploits in command of the sailing commerce raider SMS Seeadler (Sea Eagle) in 1916-1917.(Wikipedia). A truly marvelous Presentation and Association copy ! Book is Very Good, lacking the dustjacket, spine faded and barely legible. I have many other signed and Association books from the Will H. Hays estate available. . SIGNED AND INSCRIBED. Reprint. Cloth. Very Good/No Jacket. Presentation Copy. Garden City: Doubleday Page, 1927. Covers somewhat worn, binding a bit loose. The story of the WWI German war hero and his many adventures. Numerous B&W photos. Signed on the second free endpaper by Lowell Thomas AND Felix Count Luckner.. Signed by Author. Blue Cloth. Good+/No Jacket. Garden City: Doubleday, Doran & Company. 1929. VG-/G-, book is solid and clean except for a white mark to front cover, DJ has some nicks and tears to edges. ; 8vo, blue cloth, DJ, 309pp. , appendix, illustrations from photographs, INSCRIBED AND DATED TWICE BY THE AUTHOR, on front endpaper and on half title page. Count Luckner sank 14 allied ships without the loss of a single life - he turned an old American schooner into a raiding vessel which sailed through the Allied fleet disguised as a Norwegian lumber carrier, even to the members of the crew. .
Garden City Publishing Company. Used - Good. Shows some signs of wear, and may have some markings on the inside. Garden City, New York: Garden City Publishing Company. Hardcover. 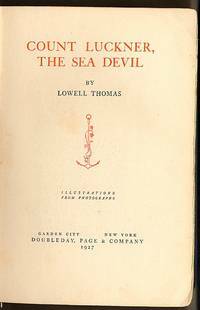 this copy is inscribed by the sea devil himself to a young lady he met in 1928 when on the world cruise with his bride the countess ingaborg. . Very Good. 1928. Later Printing. Doubleday, Page & Company, 1927. Book. Very Good Plus. Hardcover. 8vo - over 7¾ - 9¾" tall. Clean and solid copy. Contents unmarked, photographs and text clean and bright. Bound in blue cloth with gilt lettering on spine. Spine with some very light soiling, head and heel gently bumped. Front board with some play, binding cracked in one instance between front end paper and title page. Otherwise binding firm. DJ not price-clipped ($2.50). Extremely light chipping along top and bottom edges, else light shelf wear and normal age toning only. Cover illustration clean and bright. DJ in protective mylar. An excellent reading copy. .
Garden City, New York: Doubleday, Doran & Company, Inc., 1928. 309pp. Signed on the half-title page by Count Luckner! Blue cloth hardcover with gilt spine title and illustrated dustjacket. Minor bumping to the fore-corners, Chipping to the edges and corners of the dust jacket with a 1 inch by 2 inch loss to the foot of the jacket's spine panel.. Inscribed By Subject. First Edition. Hardcover. Very Good/Good. 8vo - over 7¾" - 9¾" Tall. GARDEN CITY: DOUBLEDAY. G, DISCOLORED SPINE, BUMPED SPINE TOP/BOTTOM. 1927. RARE. SIGNED BY COUNT LUCKNER WITH INSCRIPTION. LOOSE SPINE. .
Garden City, New York: Doubleday, Page & Company, 1927. Hardcover. Very Good Minus/No Jacket. 8vo. pp. x, 308. Illustrated with black and white photos. Map end papers. Book protected in mylar. Book is in clean, solid shape with Count Luckner's signature and date of 1928 on the half title page. Lettering on spine faded. A former owner's small name sticker on the front end page. New York: Doubleday, 1927. hardcover. Good. 8vo. Damp affected . Fading to spine . Wear to edge of spine and tears to top . Knocked corners. Ffep has dedication and is signed by Count Luckner and dated 1928. Garden City, NY: Doubleday, Doran & Company , Inc.. 1928. First Edition; Early Printing. Hardcover. Good in boards. Hinge has started. Foxing and toning. Some discoloration to boards. ; 8vo 8" - 9" tall; All domestic orders shipped protected in a Box. .
Doubleday, Doran & Co, 1928. No additional printings listed. Hardcover. very good/very good. NOT an ex library book. Bump bottom corner. Clean interior pages. Dust jacket has 1/4" chip and tears, price is not clipped. Garden City , New York: Garden City Publishing Company, 1927 Signed on the frontispiece verso. Spine is sunned and discolored, gilt titles are barely legible. Board tips bumped with wear at the corners and top and bottom of spine. Light rubs and cover soil. Former owner's sticker on the ffep. Foxing near the hinges on the endpapers.. Signed by Author. Hard Cover. Fair/No Jacket. 8vo - over 7¾" - 9¾" tall. New York: P.F Collier & Son Corp By Special Arrangement with Doubleday, Doran & Co. Inc, 1927 This book is in very good+ condition and appears unread. The boards are green with the lettering in green within brown and gold lined boxes.. Lowell Thomas Adventure Library Edition. Hardcover. Very Good+. Illus. by Illustrations from Photographs . 12mo - over 6¾" - 7¾" tall. Adventure, Biography. Garden City, NY: Garden City Publishing Inc, 1927. 1st Ed. Orig owners name in ink inside front cover. Wear to cloth coved boards. Break at spine end papers, overall content excellent. Hardbound. 8vo. 308 Pgs.. Good. Count Luckner, The Sea Devil by Lowell Thomas. Published by Garden City Publishing Inc, Garden City, NY, 1927. 1st Edition. Hardbound, no DJ. Size 8vo (up to 9-1/2'' tall). Condition: Good. Orig owners name in ink inside front cover. Wear to cloth coved boards. Break at spine end papers, overall content excellent. 308 Pgs. Illustrations from photographs. Description text copyright 2007 www.BooksForComfort.com. Item ID 13419. Garden City. Blue boards with navy lettering on spine. Creasing on front cover. Light surface soiling. Top outer page edges are tinted yellow. Light wear to bottom spine edge and corner tips. Map illustrated end papers. Binding is tight and square. Pages are clean throughout, although tanning with age. Illustrated. No Jacket. Light foxing to end papers. Gift inscription to previous owner on inside page. . Very Good. Hardcover. 1927. Doubleday, Page & Co. Poor. 1927. Hardcover. Poor condition, but inscribed by Count Luckner to Girard F. Oberrender (or something like that). Half-title page and frontispiece detached, and there's a split starting at rear hinge. Pages unmarked but a little yellowed. No dustjacket. Blue cloth cover worn at corners and spine tips, and spine cover is stained. ; 8.90 X 6.40 X 0.30 inches; 308 pages . Doubleday, Doran & Company , Inc.. Very Good- with no dust jacket; No marks or writing, clean tight binding; . blue cloth with faded spine lettering, edges rubbed, map endsheets toned; . NOT ex-library;. 1929. First Edition. Hardcover. Author signature on half title page in grn ink; illustrated, a German hero and sea raiders during WW I; ; Signed by Author . Garden City, N. Y.: Garden City Publishing Co; Star, 1927. Very good hard cover. No dust jacket. Faded spine, and some wear to edges of cover. Front and back cover have some spots and scratches. First couple inside pages a bit bent. . Hard Cover. Very Good/No Dust Cover. NY: Doubleday Doran, 1927 VG- (owner's stamp on ffep). Tight, clean reading copy. Illustrated by Photos. early issue edition. Binding is cloth..
Garden City: Garden City Publisjing, 1927. Hardcover. Very Good. 6 x 9 in. Custom calf boards. Condition is VERY GOOD ; minor wear, calf a little scuffed. Binding tight and text unmarked. Naut. RGR. Doubleday, 1928. Hardcover Hardcover. Very Good Condition/No Dust Jacket. Blue cloth boards with faded gilt lettering on spine. Front hinge weak, binding intact. Deckled edges (rough cut). Scattered foxing, but text mostly clean. Text is clean and without markings. Bottom corners and spine are bumped. First paste down end page has a few small spots. Faint red dye on top edge of text block. Garden City, NY: Garden City Publishing Co, 1927. Hardcover. fair to good condition. 309 pages, illus., endpaper maps, appendix, pages darkened, boards scuffed, edges of spine worn. Garden City, New York: Garden City Publisheing Company, Inc.. Hardcover. Very Good. "Felix Graf von Luckner (9 June 1881  13 April 1966), sometimes called in English Count Luckner, was a German nobleman, naval officer, author, and sailor who earned the epithet Der Seeteufel (the Sea-Devil), and his crew that of Die Piraten des Kaisers (the Emperor's Pirates), for his exploits in command of the sailing commerce raider SMS Seeadler (Sea Eagle) between 1916 and 1917. It was Luckner's habit of successfully waging war without casualties which made him a hero and a legend on both sides." Tight binding. Blue coverboards - bumped with some fraying of cloth at head and tail. Spine is faded. No chips, tears, creases on pages. Previous owner's named and date (1930) on blank page preceding half title page. Map endpapers. Black and white frontis photographic portrait of Count Luckner and several other photographic illustrations. Dampstain on bottom corner of text block, only extending on to a couple page surfaces. Copyright date 1927. Size: 8vo (8" to 9"). 309 pp. NY: Doubleday, Doran, 1928. Hard cover in original cloth. Published NY: Doubleday, Doran, 1928. 8vo., x+308 pp., illustrated with b/w plates. Fraying at crown, spine lettering dull, good plus.. Hard. Good Plus/No Jacket. 8vo. Bismarck, ND: North Dakota History, 1950. In Volume 17, Number 3 (July, 1950) issue of North Dakota History. Contains articles in addition to the above. . First Edition. Wrappers. Very Good. 8vo - over 7¾" - 9¾" tall. Garden City Publishing Company, Inc., New York: 1927. Hardcover, no dustjacket. Reading copy. Pages are discolored. Scorched spine. During World War I, Luckner ran an old sailing ship, disguised as a Norwegian fishing vessel, through the Allied blockade. He roamed the seas like a ghost and sank 500,000 tons of shipping. Illustrated with photos. Pub by Doubleday, Page, 1927. Hardcover, no dustjacket. Signed by author. Light wear, fading. Front hinge cracked. Pages clean. Good condition. New York: Popular Library , 1962. 221 pp. Cover has darkened. Browning to page edges. Copy appears unread.. Paperback. Very Good. Doubleday, Page & Co. Hardcover. B000855Z9S . Fair. 1927-01-01. 1st. NY: Doubleday Page. G. 1927. Sea adventurer during and after WWI who captured many ships and was captured also. Served in German navy, engaged in battle of . Jutland. Made a world tour in 1937-39 in his yacht, The She Devil. Map on endpapers. Sea blue binding, edge wear, bottom corners bumped, spine sl faded, owner name flyleaf. .
Garden City, NY: Doubleday, Page & Co., 1927. (1927), 308pp, illus., maps to eps, bkplt, waterstain across middle of cover, slight wear to cover. Cloth. Good +. Englewood Cliffs, NJ: Prentice-Hall, 1967. 169 pp.. First Edition. Cloth. Very Good/Very Good. 8vo - over 7¾" - 9¾" tall. Garden City, NY: Doubleday, Page. Fair with no dust jacket. 1927. Hardcover. Bio of WW I German hero, B&W Ills., Maps on eps, front hinge starting, Title page and prelims soiled, Blue/green covers soiled w/ spots on rear panel, ink line on front panel, spine faded, edges rubbed and bumped. .
Doubleday, Doran & Co. Good. 1928. Hardcover. 8.10 X 5.60 X 1.50 inches; 308 pages . Garden City, NY: Garden City Publishing. 1927. Reprint. Hardcover. Very Good with no dust jacket; Spine is faded. Edgewear. Previous owner's name; B&W Photographs; 309 pages .